– training pre & post operative surgical staff. This clinic has only recently moved to PPSC in Phnom Penh. All treatments are free of charge and are provided by a skilled Cambodian team led by Cambodia’s leading plastic surgeon, Dr Nous Sarom. If a child was born with a cleft palate in the developed world, they would receive surgery within days of birth. 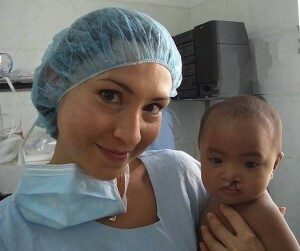 In Cambodia many parents cannot afford this surgery and their baby faces a childhood of suffering. A baby with cleft palate can have difficulty nursing, malnutrition and recurring ear and throat infections. The facial deformity exposes the child to persecution and neglect. Many assume that he or she is mentally retarded. A cleft palate operation costs just $USD150 (2009). New operating microscope from NZ for Rose Sight Center. Unsung Heroes Cambodia: a new book !